Scandal, scandal, scandal. We haven't talked much about local D.C. politics in recent weeks, but there's a lot (allegedly) going on around Mayor Gray's office. And that all tops off the whole fiasco over two SUVs. The world is keeping us busy this week, so buckle up for some snark. The world is watching the latest reports from Japan after several incredibly powerful earthquakes have devastated the northern part of the island nation. 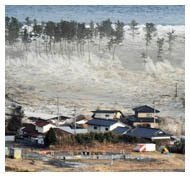 The first quake registered 8.9 on the Richter scale and its epicenter was approximately 250 miles northeast of Tokyo. A resulting tsunami raced across the Pacific, but thankfully did not cause significant damage to coastal communities that had been on alert. Please consider helping out by donating to organizations such as the American Red Cross. Barry held a press conference today to update us on American aid to Japan, Libya, and rising gasoline prices. One thing that stuck, especially to environmentalists, is Obama's mention of future oil exploration off the Atlantic coast and in Alaska. Um, did he just stir up the hornet's nest? Scott Walker is claiming victory after Republicans in the Wisconsin senate voted on a separate non-spending bill to strip collective bargaining rights from public unions. He signed the bill into law today. Not surprisingly, thousands turned out to protest at the capitol. Wisconsin Democrats are vowing to recall those who supported the measure, including the governor. Also, could this really be all about Barry and 2012? Media-type peeps are keeping the buzz alive for a possible 2012 Donald Trump campaign. Mmm, maybe that's what he wants... crafty! Meanwhile, other prospective candidates are NOT talking about jobs and the economy. No, rather "family values" candidates are focused on tamping down those pesky inquiries about adultery and multiple divorces. A truly historic start to the GOP primaries! In keeping with that no jobs and economy theme, Politico is reporting that congressional Republicans are looking to fight the budget battle over social issues, on top of defending DOMA. Hooray! Sen. Bernie Sanders introduced a bill that would include a 5.4% surcharge on people who have an annual income of more than a million bucks. A reasonable idea, but it probably won't go over well with the freshmen. France became the first country to recognize Libya's opposition council as a legitimate body. Hillary will be meeting with opposition leaders and State is sending an aid team to areas under control by rebels, who are in a perilous situation fighting a well-armed Gaddafi army. James Clapper may be right that Gaddafi stays, but he's in hot water with the White House and Congress. Whoops. Meanwhile, Obama's national security team has laid out a six-point plan to remove Gaddafi, without the use of no-fly zones. Senate Republicans are airing a sigh of relief as one of their own, John Ensign, will not be seeking re-election. Ensign is likely VERY jealous that he couldn't follow in David Vitter's footsteps. We're hoping that make-up expert Sharron Angle will make another run, but hey, it's only a wish. Scotty wishes that video of him begging David Koch for money--at a dedication for a cancer research center, of all places--would simply disappear. Real classy, dude. New York role-model Rep. Pete King opened his hearings on "Muslim American radicalization" Thursday. Critics claim the hearings have a hint of McCarthyism. Extra capitol police were on hand for security, and despite threats, the congressman is going to keep doing his thing, for whatever reason. But hey, supporting the IRA is a whole different matter, right? Meanwhile, Florida is the latest state where legislation is being considered to outlaw Sharia law. Mmm, maybe we at Turner Central are living in a different reality, but we don't quite get this whole threat of Sharia in the United States. Commerce Secretary Gary Locke is replacing John Huntsman as the new U.S. Ambassador to China. Don't worry, Barry, he won't be using his new position as a stepping stone for 2012. We swear. Tuesday was International Women's Day 2011. 2011 marks the 100th anniversary of this important day. This year's theme was education and a pathway toward employment for women. Discovery returned safely to the earth for the final time, marking the end of its 27 years of service. The shuttle's likely to headed to the Smithsonian's National Air and Space Museum. Turns out CBS got the last laugh, for now. Charlie Sheen was promptly fired from his little perch at Two and a Half Men. Couldn't get that $3 million per episode gig, eh, Charlie? He's suing Warner Bros for "owed" money from the remaining canceled episodes. You know, Charlie, you wouldn't be in this situation, and screwing over the cast and crew, if you weren't so nuts. Bieber fans got a little too rowdy for the police in Liverpool. The cops even threatened poor Biebs with arrest for "inciting" the riot atmosphere. So demanding, you Bielebers! Game Change is coming to your television screen sometime in the near future. Julianne Moore has been cast to play the nightmare Gramps unleashed on America during the 2008 presidential campaign. We skipped the reality show, but this may be too good to pass up. Oh, and Michelle Malkin is hating on the project already. Shocker. James O'Keefe's latest victim is NPR. A former executive was caught ranting against the Tea Party people with a pair of phony Muslim advocates. Doesn't anyone do background checks anymore? NPR's chief executive resigned in the wake of the video release. Also, former NPR contributor Juan Williams ripped his former employer. This week's edition of Twitter screw-ups features Chrysler. A PR contractor is out of the job after getting personal with Motor City drivers. Note to anyone running multiple Twitter accounts: ...you know what? If you can't handle running Twitter accounts, it might be time for a new career. Highway truck crashes can be so beautiful. But, seriously, we hope no one was hurt. Road workers will have a lot to do now. The iPad 2 is out today and some analysts predict the second generation iPad will outsell it's predecessor 2-1 in the first 24 hours. Apple stock, anyone? Have an artful sweet tooth? March 14 is the submission deadline for the Washington Post's Peeps Diorama Contest. Make something cute! Aliens are invading L.A. Yes, if you're interesting in that sort of thing, and maybe haven't seen other similar movies, Battle: Los Angeles debuts today. Head over to Georgetown or where ever you prefer to see flicks on the silver screen. Have a craving for some Indian food? (Ed. note: ALWAYS.) The Rooftop Terrace & Bar at the John F. Kennedy Center for the Performing Arts is hosting the second session of A Taste of India on Saturday. Learn about the food that you're stuffing your face with. Hoops fans -- the Wizards are going up against the Clippers at the Verizon Center this weekend. Or, if you prefer something more intense, come down to Queenie's alma mater for some boxing. Spyda the DJ is coming to U Street. You may have heard Spyda's tunes out at the Waterfront or at any of the Caribbean carnivals. Keep Japan in your thoughts. This is a tragedy that will stay in the news and our hearts. Back home, Wisconsin Democrats (and Michael Moore) are promising us observers a rough-and-tumble gambit in the weeks ahead.